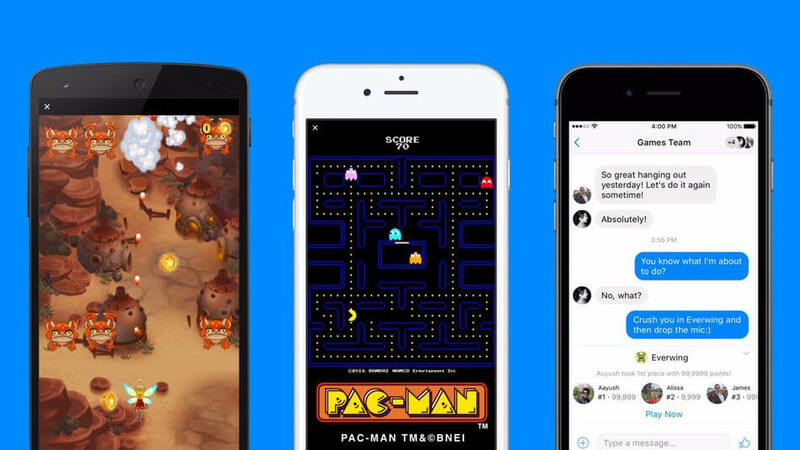 Facebook has announced an update to its Messenger platform that makes games a central part of the popular messaging client. Dubbed Instant Games, the new feature is available in 30 countries on Android and iOS devices starting today, with a total of 17 games to get things rolling including the likes of Pac-Man, Galaga, Space Invaders, Arkanoid, Everwing and Words With Friends. The new HTML5 gaming platform works on both the web and mobile, letting Facebook users play games on Messenger and in the Facebook News Feed without the need to download anything. To start a game on Messenger you just need to tap on the game controller icon in your conversations next to the photos and stickers buttons and choose the game you want to play from the list. Facebook Messenger automatically shares high scores and leaderboards to the thread the game was launched from so its easy to challenge people. Players will be able to share high scores and achievements on the News Feed, and friends can jump right into the action from Facebook’s app or website. For now, the platform is in closed beta, but developers can apply to build Instant Games. The company has previously experimented with games on mobile by hiding basketball or soccer mini games that launched when sending a specific emoji to a friend. And of course gaming was also a big — and annoying — part of Facebook’s website a few years ago with FarmVille and the like.